One of the most peaceful places in Siouxland is also bustling with life and adventure. 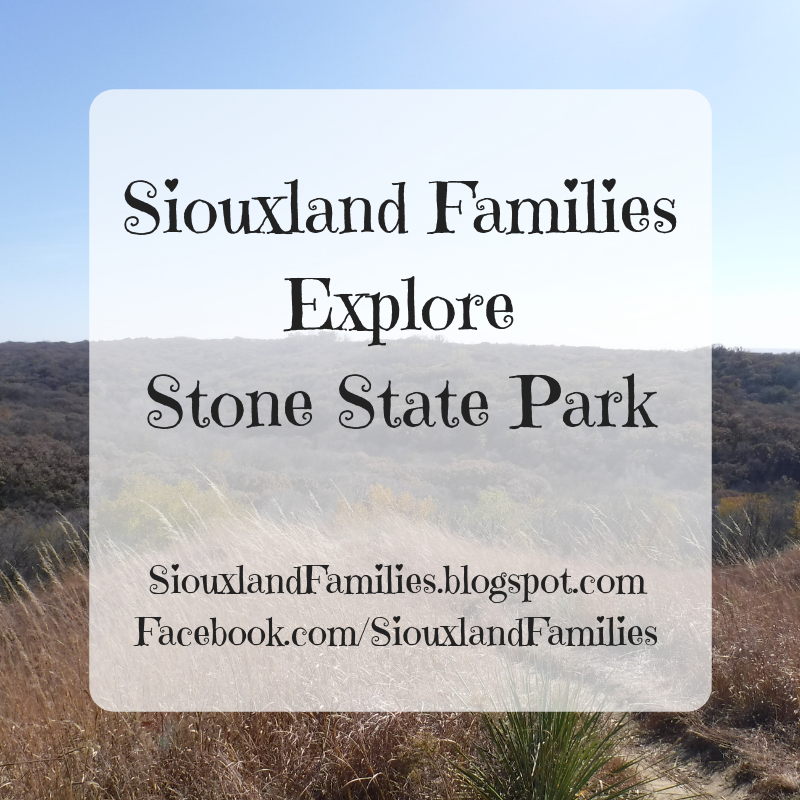 Stone State Park, nestled in the northwest corner of Sioux City, provides just under 1600 acres of hiking, fishing, camping, and other outdoors fun, and it especially shines in fall when the leaves change colors! Stone State Park's official address is 5001 Talbot Road, and you can get to it from Highway 12 on the west of the park, or Stone Park Boulevard or Talbot Road from the east of the park. Stone Park is part of the Loess Hills, a unique geographic formation of a type only found here and one place in China, and the trails have varying scenery of woodland or prairie type plants. Stone State Park is considered an "urban wildlife sanctuary" and has a rich history which includes a zoo built there a century ago and torn down decades ago, and a Civilian Conservation Corps camp between the World Wars (the CCC built the Lodge and many of the other structures and entrances!). The road through the park is considered part of the Loess Hills scenic byway, and if you have time, is a beautiful way to get from the north side of town to Riverside. The Dorothy Pecaut Nature Center is connected to Stone Parks by hiking trails, but to get there by car, you have to take Highway 12 for just a few minutes (the Dorothy Pecaut Nature Center is south of the Stone Park entrance on Highway 12). You can read more about the Dorothy Pecaut Nature Center on the Woodbury County Conservation website. The park offers 6 miles of equestrian trails, 6 miles of trails for mountain bikes and snowmobiles, and 8 miles of hiking trails, plus there are many deer trails that are fun for adventurous hikers. There are several camping cabins available for rent, as well as a large lodge with its own kitchen and restrooms that can be rented for events. There are also campsites for tents or RVs, a few shelters, lots of picnic tables and benches scattered throughout the park, a playground near the highway 12 entrance, and a fishing dock. Our favorite activity at Stone Park is hiking. The trails tend to have a lot of hills, some pretty steep, so for most of the trails I recommend sturdy hiking boots or shoes if possible, or running shoes with good traction at the least, and toddlers will need to be in a carrier for much of the time, and preschoolers will likely need some assistance on the steepest hills. For a flatter walk, try parking at the Pammel Valley shelter and walking along the lake a bit. It's not a very long hike, but it's beautiful and the terrain is easy enough for most kids and many people with limited mobility. Our 9 year old did great with the hills, and our younger two loved exploring from the safety of carriers most of the time and on their own feet on the flat bit! While we rarely see animals other than bugs and birds at Stone Park, there are many species known to live there, including deer, turkeys, vultures, coyotes, foxes, snakes, frogs, and some rare butterflies, and it's fun to help your kids find signs they were there. We saw a stump covered in beaver teeth marks, and footprints from deer and raccoons! My kids were so excited to see them and guess what kind of animal made each mark. The raccoon print is especially fun to compare to a human kid hand! There are also many wildflowers in bloom throughout spring and summer. If you stop at the Dorothy Pecaut Nature Center before hiking, they have a brochure available with the estimated blooming dates of many of the flowers visible in the park, along with trail maps and other information about the park. 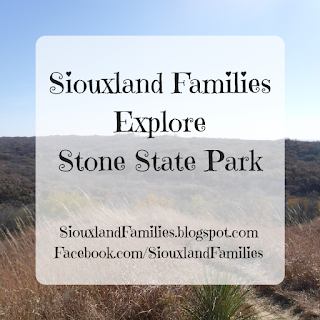 Overall, Stone Park is a beautiful place to hike, picnic, and play that always leaves our family feeling refreshed, and I definitely recommend it to Siouxland families and to visitors. You can find out more about Stone State Park on the Iowa Department of Natural Resources website. For more of our favorite places in Siouxland for adventures with kids, check out the Siouxland Families Explore page.